We all like to spend time outdoors when the warmer weather comes around, and you probably don’t make as much use of your outdoor areas as you should. A patio, deck or garden is a great place to sit and relax on a warm evening – or even on cooler nights if you have outdoor heaters – and if you have friends around, you want that deck area to be perfect for use. 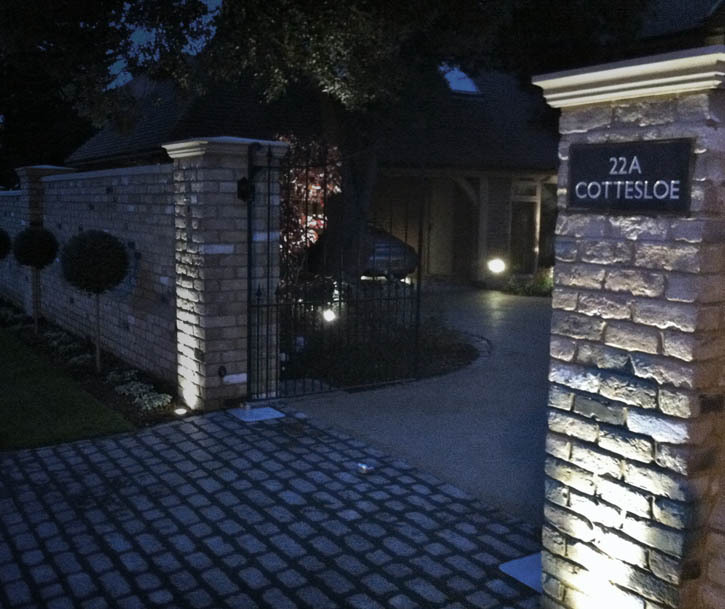 The best way of making sure your outdoor spaces are comfortable and usable is to make use of some of the best outdoor lighting ideas and put them into action. In recent years, LED lights have become the choice for many people when it comes to backyard lights. LED’s are energy-efficient, can be found in white and a wide range of other colors, with the added bonus of they last a VERY long time. Let’s look at some of the best outdoor lighting ideas and techniques used around the world, and you may be pleasantly surprised at how affordable it can be to have beautifully lit outdoor spaces. A great way of lighting larger areas and one of the most common exterior lighting ideas – for perhaps a bigger patio or courtyard space – is a solar lamp post. Available in many different styles and sizes, they can provide huge levels of brightness. Some versions can flood your outdoor space with 3000 lumens, enough to create virtual daylight at night, but they’re also available in dimmer versions for a more subtle glow. Positioned high above, on a pole or sometimes attached to walls, solar lamp posts are an excellent choice for larger gardens as they can save you considerable amounts of money. Sunlight charges the batteries during the day, and they light your garden by night meaning there are no running costs on your electricity bill. You can learn how solar panels work here. Solar lamp posts make great outdoor lighting ideas and are also very effective if you have a long driveway as a few solar lamp posts not only look luxury but add that safety element. Look for adjustable models that you can select different levels of brightness for, as well as those with motion sensors for extra versatility. Among the simplest and yet most effective exterior lighting ideas is to buy decorative outdoor string lights, which come in a variety of different types, lengths, and colors. Hang a few long strings of LED lights around the patio and you can create a beautifully cozy effect that will provide you with lovely soft light in which you can entertain your guests. Placed around a pool or even draped on your outdoor walls and window frames, you can decorate your outdoor space very cheaply and with long-lasting LED lights, making LED string lights great outdoor lighting ideas. Some are available with flashing modes or cycle through a range of colors to add a changing atmosphere to your garden. They’re super easy to use – simply put them up, plug them in, choose your setting, and that’s it! A patio is perhaps the best place, along with your decking area, to let the party continue as night falls, especially if it is lit. One of the most impressive methods of lighting patios and decks – and they can be used elsewhere to great effect – is to use patio umbrella lights, and you can choose from many beautiful designs. Available in many different styles, the umbrella light casts light downwards bright enough to light the area around, but not too bright to spoil the intended effect. A few LED patio umbrella lights placed at intervals around the patio you want to light can give a quite wonderful effect, and you’ll find it’s where your guests gather to chat. Inexpensive, simple to use and often very attractive, this is the way to get plenty of light but still retain the joy of the night-time. If you haven’t heard about outdoor LED furniture, you really need to check it out! Among the many benefits of the LED is that it does not create a heat source as many other lighting effects do, so it can be used in a variety of ways safely. So if you are looking for some outdoor lighting ideas for seating, outdoor LED furniture takes many forms and can be quite spectacular. Designers have created, for example, a chair and sofa made from a material that is opaque yet, when lit by LED from inside, glows quite beautifully. You can also find tables, plant pots, and a whole range of other items that are lit from within by LED, and that make great talking points for your party or gathering. Another benefit of the LED is that it is cheap to run – far more energy efficient than other lighting sources – so even if you have a large LED sofa, it will only cost a few cents to run. A pond makes a beautiful feature in any garden or yard, but is even more so if it is lit at night. LED pond lighting is a fantastic way of bringing out the best in your water feature. If you’re outdoor lighting ideas are to do with lighting up your pond, why not place some of the popular solar lights on spikes around the pond for an effective method of highlighting your ponds features, but also install some submersible pond lights to add an underwater glow. These backyard lights can be placed in the water and rest at the bottom of the pond. They are available in a wide variety of types, brightness, and colors, with added effects such as flashing or cycling through the color range. Battery powered and, of course, fully waterproof, they bring a pond or water feature to life at night. If you happen to have a waterfall or fountain, the effect of lighting it can be quite spectacular, and thanks to LED’s is not expensive to run. Some of the outdoor lighting ideas we have mentioned so far are mains or battery powered. The former is fine if you have a power point close by, the latter ideal if you want lights on for a short period. The biggest advances in outdoor lighting have come in the form of solar lighting. Modern solar panels are very effective – the latest don’t even need direct sunlight to charge – and can power your lights for several hours at a time. Outdoor solar LED lighting comes in a variety of forms. Some people use solar motion sensor lights, complete with motion sensors to shine a bright light on any areas where intruders may take their chance. This form of backyard lighting ideas are also popular in lamp posts as we mentioned earlier on, and individual lights that you place in the ground using a stake. Cheap and effective, check out the many different types of outdoor solar lighting ideas for inspiration. Uplighting, one of the favorite backyard lighting ideas among interior designers. Uplighting is a method that looks great in any room – but what about using it as an outdoor effect? If you are looking for outdoor lighting ideas for a decking area, for example, you could place a few LED lights around the edge – or even within the deck as you can buy lights designed to be placed flush with the floor – for a truly beautiful effect. You could use lights set beneath your outdoor furniture – much as you might use uplighting in a kitchen at the base of your cupboards – and this looks particularly impressive when the lights are colored. At the edge of your patio area, a few lights placed low down and shining up a feature wall – you could use solar powered lights for this very effectively – adds a nice touch. In fact, there is so much you can do with uplighting, and outdoor lighting in general, so take these suggestions as ideas and inspiration, and let your imagination run wild! And there you have it, some great backyard lighting ideas that will help you transform your garden.